The lifeboat covers the Menai Straits area between Anglesey and the North Wales mainland, and is one of the busiest in Wales. Celebrating over 100 years as a lifeboat station, the crew have been honoured with 12 awards. Beaumaris Lifeboat is one of seven Lifeboats originally provided by the viewers of the Blue Peter Television Programme. The latest Lifeboat at the station is the Atlantic 85 inshore lifeboat, the most advanced inshore lifeboat ever produced by the RNLI which can reach speeds of up to 35 knots and features state-of-the-art technology to enhance its lifesaving capabilities. It will be 50 years in May 2017 since the crew of Beaumaris All weather lifeboat had to learn additional boating skills with the arrival of the first Blue Peter 2 lifeboat at Beaumaris. This was a D class inflatable and since then the station has operated four Blue Peter 2 lifeboats increasing in size from the original D class via the Atlantic 21 to an Atlantic 75. The current Atlantic 85 lifeboat named Annette Mary Liddington was launched on her first service from the station in January 2010. She was provided by the generous bequest of Mr John Grover Liddington in memory of his mother and other donations to the Beaumaris Lifeboat Station Local Appeal. and is named after the mother of the donor who funded the major part of the cost of the lifeboat. Family fun day at Beaumaris lifeboat open day. 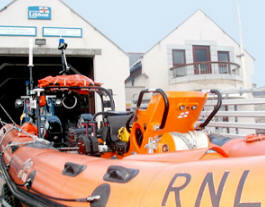 An Open Day at the lifeboat station which will involve a demonstration by the lifeboat. A number of other organisations and stalls are expected to also be in attendance. For more information, please contact John Pulford via phone 07824 764474. We look forward to seeing everyone back here for the 2019 event. For exciting updates about the day, please follow our Facebook page!